Cardington’s Kyleigh Bonnette sets the ball for a teammate in her team’s Tuesday night win at Mount Gilead. 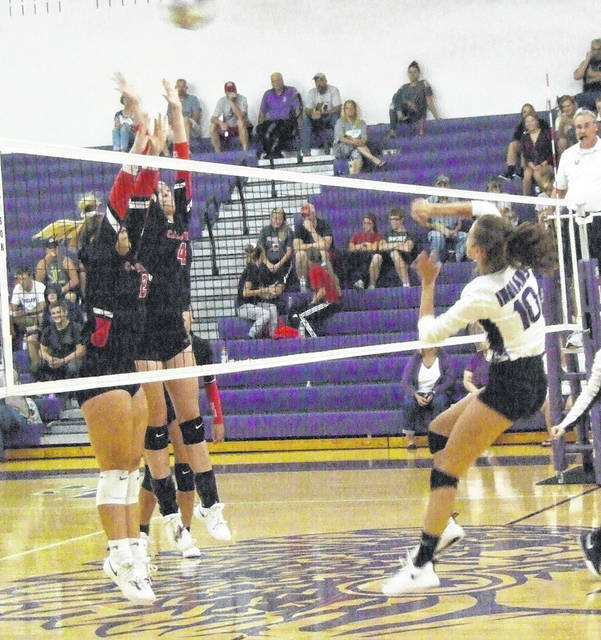 Maddie Mathwig places a hit over Cardington’s defense for Mount Gilead on Tuesday. 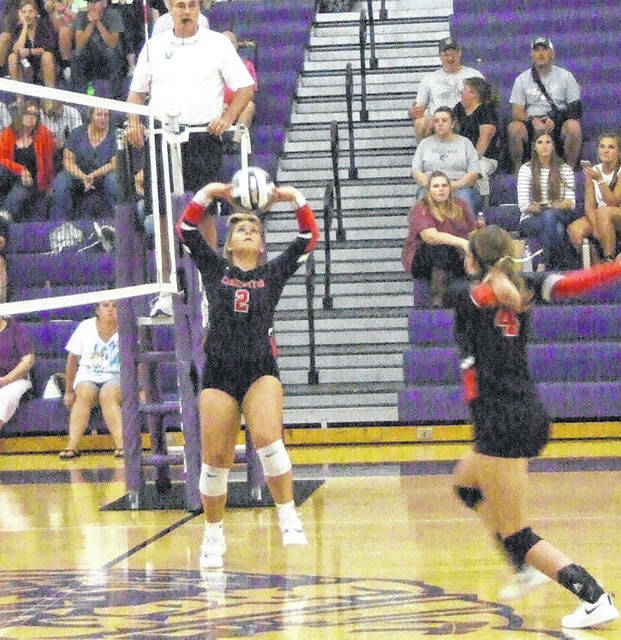 Cardington got off to a fast start at Mount Gilead Tuesday in a KMAC volleyball match and never looked back in claiming a 25-8, 25-9, 25-14 win. Maci Morgan opened the match with nine straight points on her serve to stake the Pirates to a commanding lead. Paige Clinger then added four more to make the score 14-1. While Jessica Brewer scored once and Maddie Mathwig added a pair of points, MG could only get within an 18-7 margin before Cardington got two points from Kayleigh Ufferman and three from Gabby Snodgrass to take the first set. The Pirates got off to another fast start in the second set, Kirsten Bonnette opened with four points before Clinger scored three and Kyleigh Bonnette added one to give their team an 11-2 lead they would not relinquish in going up 2-0 in the match. Treese noted that when his team opens up a lead on an opponent, the challenge is to maintain that advantage for the rest of the set. Five points by Morgan staked the Pirates to another early lead in the third game. MG would attempt a comeback, as trailing 14-7, they got a defensive point, a point from Molly Murphy and three from Brewer to close within a 16-13 margin. Cardington would bounce back to get a defensive stop and a point from Kyleigh Bonnette to take a five-point lead. Then, with the score 19-14, they got six straight from Hannah Wickline to finish off their win.